Hindi Jokes, Hindi Comedy, India Comedy, Hindi Chutkule, Hindi Comedy Stories, Hindi Sarda: Taj Mahal - A symbol of love? 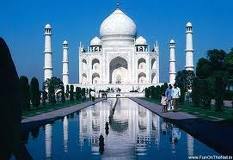 Taj Mahal - A symbol of love? We know TAJ MAHAL as a Symbol of Love. 1. Mumtaz was Shahjahan's 4th wife, out of his 7 wives. 2. Shahjahan killed Mumtaj's husband 2 marry her. 4. He then married Mumtaj's sister. Labels: first time jokes, hindi shero shayari jokes, taj jokes, taj mahal jokes, taja jokes, What is love?